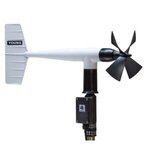 The 200-18802 Anemometer Drive provides a convenient and accurate way to rotate clockwise or counter-clockwise at any rate between 200 and 15,000 RPM in 100 RPM increments. 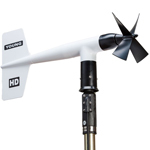 The 200-18112 Vane Angle Bench Stand is used for benchtop wind direction calibration of the Wind Monitor family of sensors. The 200-18802 Anemometer Drive provides a convenient and accurate way to rotate clockwise or counter-clockwise at any rate between 200 and 15,000 RPM in 100 RPM increments. The LCD display id referenced to an accurate and stable quartz timebase. For completely portable operation, the unit can be operated on internal batteries. For extended operation, an AC wall adapter is included. 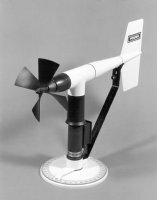 The 200-18811 Anemometer Drive is identical to the 200-18802 except the drive motor incorporates a gear reducer for operation in the range of 20 to 990 RPM in 10 RPM increments. The lower range is recommended for cup anemometer calibration. The 200-18112 Vane Angle Bench Stand is used for benchtop wind direction calibration of the Wind Monitor family of sensors. 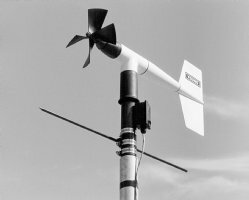 The mounting post engages the direction orientation notch on the Wind Monitor. An easy to read pointer indicates 0-360° with 0.5° resolution. 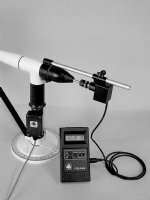 The 200-18212 Vane Angle Fixture Tower Mount, similar to the 200-18112, the tower mount feature allows use on the tower as well as the bench top. The fixture is temporarily placed on the tower between the Wind Monitor and its tower mounting. Index keys and notches are engaged to preserve direction reference. 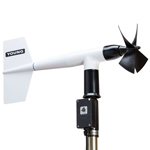 The 200-18310 Propeller Torque Disc checks anemometer bearing torque with 0.1 gm/cm resolution. The disc temporarily replaces the propeller for torque measurement or simple yet accurate pass/fail checks. Charts included with the unit relate torque to propeller threshold with limits for acceptable bearing performance. 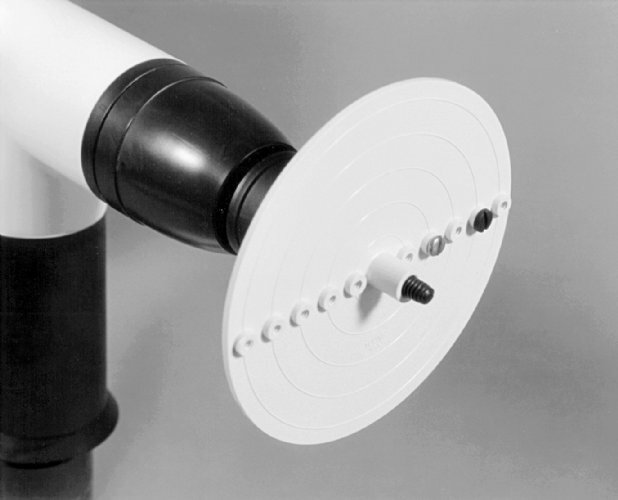 The 200-18312 Cup-Wheel Torque Disc checks cup anemometer bearing torque. The 200-18301 Vane Alignment Rod helps align the vane of a wind sensor to a known direction reference during installation. 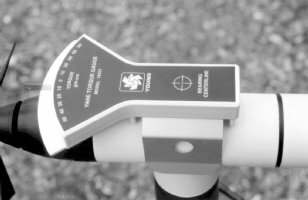 The base of the device has an index key that engages the direction orientation notch in the sensor allowing the sensor to be removed without losing wind direction reference. The 200-18331 Vane Torque Gauge checks vane bearing torque of Wind Monitor family of sensors. Slip the fixture over the main housing and make simple yet accurate vane torque measurements. Charts relating vane torque to vane threshold provide limits for acceptable bearing performance.